Then there is the burble concerning the memorial to Caroline Hay Taylor at St André’s cemetery. 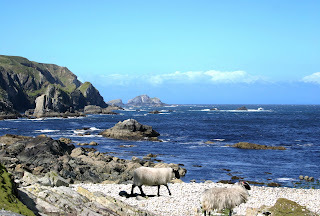 Mahon’s burble follows Beckett’s poem closely in most respects (...) Each depicts Taylor as remaining ‘true to her belief’ (fidèle à sa philosophie) that ‘there is hope while there is life’ (qu’espoir il y a tant qu’il y a vie), and each mentions that she escaped Ireland with this view intact. But Beckett dates this flight as occurring ‘en août mil neuf cent trente-deux’, which Mahon ‘translates’ as ‘in August nineteen-twenty-two’. Why makes this revision? Did Mahon’s considerable facility with French fail him at this moment? Probably not. For a start, I can’t believe that was anything other than a mistake on Mahon’s part. But if not, to suggest that the fact of the Irish Civil War in 1922, with all its opportunities for ready-to-hand poetic significance, should trump the bald fact the woman died in 1932 – this embodies perfectly, for me, my objections to the unearned exceptionalism of Irish Studies. She died in 1932, not 1922. Some pointless Irish civil war is not a good enough reason for assuming to yourself the power to alter this fact. Mahon made a mistake, and I defy anyone to convince me otherwise, or explain why that otherwise can be anything other than a species of wish-fulfilment. 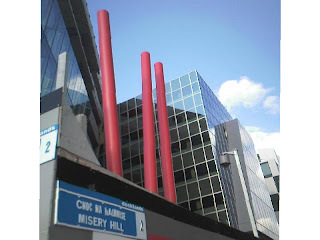 Photo shows an old stomping ground of mine, Misery Hill on the south bank of the Liffey. I hadn’t been back for a decade or so. Someone had stencilled ‘I’m Nobody? Who Are You?’ on a hoarding on the other side of the street. I don’t have a copy of The Best of Myles to hand, but fondly remember his rejection of the suggestion that, while the average English user had a basic vocabulary of 400 words that average Irish speaker used 4000. The real figure is in fact closer to 400,000, he declares, while in Donegal there are some Irish speakers so rich in Gaelicness that they pride themselves on never using the same word twice in their lives. I was reminded of this more than once during this last week in Donegal, as during a presentation on the 89-year old who was commended to us as the possessor of the richest Irish in the county. Irish-speakers will frequently use the patronymic system, e.g. 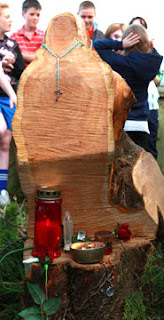 Tom Phaidí Sheáin, but this man had no fewer than ten components in the family tree of a full name he carries around with him, tracing his lineage all the way back to the 1730s. If he isn’t in the Book of Leviticus too he obviously should be. I’ve been to the Donegal Gaeltacht before (Gortahork, Falcarragh), but one of the things that makes Glencolumbkille distinctive is that those places, remote as they are, are at least, or can be, on the route to somewhere else. Glencolumbkille is at the end of the line and 26km from the nearest sizable town (and ATM), Killybegs. It appears to be a Garda-free zone too, with all the delightful implications this has for pub opening hours. The pubs are full of music, just about every evening. I was most disappointed to learn that the great Glen fiddler James Byrne had died last November, but I got to see his widow and daughters play in Roarty’s, several times, as well as the legendary Tommy Peoples and, down from Glenties, Peter and Jimmy Campbell. Oideas Gael, where I was taking my Irish language course, has one of the few surviving examples of the tin fiddles endemic to this part of the world, as occasionally played by the greatest of all modern Donegal fiddlers, John Doherty. Donegal fiddling, to start repeating myself from the last post, appeals to me in its relentless eschewal of vibrato and unapologetic scratchiness, its horde of eldritch eighteenth-century Scottish crossovers, and utter singularity to its own place and nowhere else. the Irish for jellyfish, smugairle róin, means ‘seal snot’. 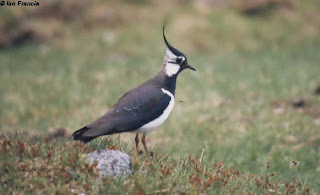 the Irish proverb Is fad ó bhaile a labhraíonn an pilibín (‘it is far from home that the lapwing sings’) refers to the lapwing’s habit of leaving its nest to sing, to mislead predators as to the location of its eggs. This I did not know. 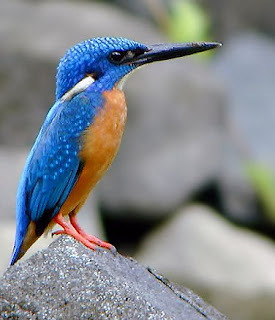 that the first of the list of seven times’ seven words that end in ‘óg’, birds, goes like this: druideog, fáinleog, faoileog, fuiseog, glasóg, riabhóg and spideog. The other six refer to trees, martime things, parts of the body, plants, things around the house, and women, and I will happily burn a CD of Donegal fiddle music for the first person who tells me what they are. Photo (not by me, own pictures to follow) shows the awesomely remote abandoned village of Port, over the hill from the Glen. And to everyone I met there, from the barmaid leaning out the window watching the Glen v. Carrick GAA match through binoculars, to the fiddlers, to everyone who spoke even one word of Irish I say: Mór sibh a laochra Gaeil! 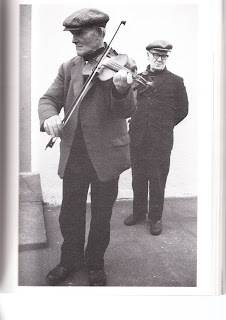 A marvellous image of fiddle-playing brothers Francie and Mickey Byrne from Kilcar in Donegal. I’ve always loved Donegal fiddle music, the scratchy, cat’s gut rasp of it (seem to be having a Seamus Heaney moment here), and was thrilled on a trip to Donegal a few years ago to put some musicians in Gortahork to the test by asking if they knew ‘The Cat That Kittled in Jamesie’s Wig’, as played on the 1987 Claddagh album The Brass Fiddle by Francie Byrne (I think Mickey had died by then), and yes indeed they did, striking up its yawping descending ninth. This by way of saying I’m taking off to Glencolumbkille in south-west Donegal for a week to brush up on my Irish and annoy the locals with requests for obscure John Doherty reels. An Australian poet I was most happy to rediscover down under last year is Robert Adamson, whose new Bloodaxe collection The Kingfisher’s Soul I review (in brief) in today’s TLS. But as they’ve snipped the last sentence off I’d like to log it here: ‘Like Amy Clampitt’s kingfisher, these poems are flushed with “the color /of felicity afire.”’ And since I can hardly leave it at that, here’s the end of his poem ‘Creon’s Dream’ by way of illustration. I sleep in broken snatches and dream nothing. dissolve, waves of the dead arrive in dreams. work in the kilns and darkness is complete. Trieste is the Hull of Italy. Each city is a port out on an eastern limb, often overlooked by the rest of their respective countries and... there the comparison breaks down. Oh, and both cities have a disproportionate literary tradition (Stendhal was French consul in Trieste, and then there’s Svevo, Joyce, Umberto Saba and Magris, for starters). I mean, it says something about Trieste that Philip Larkin should have chosen to spend that crucial formative decade there rather than in Florence, Milan or Venice: a strangely neglected period of his life, I find. And consider that Triestine graffito, a pleasant change for me from the endless bits of Wilfred Owen and Isaac Rosenberg you see sprayed on gable-ends round the place here in East Yorkshire. Ungaretti served at the battle of Caparetto, I did not know before my latest trip to Trieste, though his later enthusiastic fascism all through the Mussolini years takes any dulce et decorum est edge off that fantastic two-liner of his, above. He shared the irredentistism of his fellow Futurists, who sent a Volunteer Bicycle Brigade to the northern front, which must have come in handy among the tanks and mountains of that savage theatre. The Italians lost 1000 men a day for two years; there is still a street in Trieste named after the walrus-faced old idiot who masterminded this hecatomb. On the subject of statues, I heard from John McCourt (author of the most excellent biographical study of the Triestine Joyce The Years of Bloom and a fine singer too, let me add) that all manner of Austrian statues are being re-erected there too, who knows why, or why now. And still on the war, Marinetti, I learned, spent his war years digging latrines, while Wittgenstein too saw action on the Italian-Austrian front, serving as a private in his war-long but ultimately quixotic attempt to get himself killed. I didn’t encounter any contemporary irredentists casting surly glances over the border at Koper (Capodistria) or Rijeka (Fiume, site of D’Annunzio’s finest inglorious hour), but given the tendency of these towns to change name under a new flag, I hope the Italians leave well enough alone in the nearby Slovene district of Arse. Why Joyce, who used to hide from thunderstorms in the cupboard, ever agreed to live in Trieste I don’t know, given that copious thunderstorms cascaded down just about every single day I was there. Ah Trieste, ah Trieste, ate I my liver! I have returned from Italy, my thoughts on which anon (the secret ingredient for submarine paint is nun’s sweat), but first some items of note fished from the pizza menus and ads for patio salesmen cluttering up my porch. and not a bad day, as days go. The latest issue of that fine Dublin journal The Stinging Fly features a comprehensive and provocative review of Paula Meehan’s latest, Painting Rain. One thing I like about the review is how it takes and acknowledges the whole context and background of Meehan’s work then, in the nicest possible sense, ignores it. It will not have been so important to how we read her, in the end, that Meehan spent a lot of time giving poetry workshops rather than working in life insurance, whether the ‘I’ in her work is identical with its author, resembles her closely, or even not at all, given the secret life we have now established for her a life-insurance saleswoman. Speaking of fine Dublin journals, I mentioned, a long time ago now, an upcoming piece of mine on Beckett’s letters. It can be found (in the print copy only, I mean) here. I learn from the sleeve notes that the Touareg never use that word to refer to themselves, given its Arabic provenance, and should in fact be referred to as the ‘Inazaghen’, the people of Adagh, which is almost a town in Co. Louth but, luckily for the Touareg, isn’t quite. I recommend this album, and the various magazines and books listed above.